ArtsCalibre Academy is a small but highly reputable school whose mandate is to provide an outstanding, Arts-enriched education at an affordable cost. We offer a dynamic and diverse program designed to challenge students academically, while encouraging exploration and development of their creative and other innate talents. We use the Arts as a vehicle to deliver and exceed the BC Curriculum in a safe, experiential environment. with education and why ArtsCalibre Academy strives to be different. If you walk through the doors of ArtsCalibre Academy at 7:30 AM, you will see the teachers there busily preparing for the day. At 8:30 AM the doors open to our students and they enter beaming in anticipation of what the day holds for them. But what is beyond those smiles? What is so special about our approach to education – the strong integration of the Arts into our curriculum? Why should you choose ArtsCalibre Academy? The reasons are many and are widely and credibly documented. Years of research demonstrate that Arts education is closely linked to everything we want for our children and demand from our schools: academic achievement, social and emotional development, engagement and equal opportunity. Involvement in the Arts is associated with strong gains in math, reading, cognitive ability, critical thinking and verbal skills. Arts enriched learning can also dramatically improve motivation, concentration, confidence and teamwork. Why are our children so excited to come to school every day? The intrinsic stimulation and pure pleasure of an Arts enriched experience does more than enhance a child's learning. It connects them more deeply to the world and opens them up to new ways of seeing it – creating a foundation for forging strong social bonds and building community. 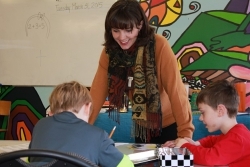 Combine the benefits of an Arts education with Stephen Covey's "The Leader in Me" Program, the “MindUP” Approach, and elements of so many other effective philosophies and tools that we embrace…and we feel that we truly have a “win-win” situation. When I asked one of our Grade Five students what it is about ArtsCalibre Academy that she likes, she said "We are not taught to our grade, we are taught to our ability and skills. We are encouraged to challenge ourselves in every area." Another student reported “I don’t know…it just feels good.” Simple words – but to me they are profound and reaffirming. Inspired and want to know more? Please poke around our website for a closer look at our programs, and feel free to contact us any time. I would welcome the opportunity to personally answer any questions you may have. ArtsCalibre Academy offers a dynamic and diverse program designed to challenge students academically, while encouraging exploration and development of their unique and artistic skills and talents. 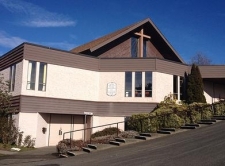 Find out more about out two beautiful, spacious facilities in Saanich that we operate out of. Check out our bios! In the words of Ms. Tara, this is what learning at ArtsCalibre Academy is all about. Wow, I can't believe the effect. She's so confident and brave now. The other day she went up to a bunch of new kids at the playground and asked if they wanted to play "Ring Around the Rosie"! From our bi-annual Theatre Productions, to community events, open houses and fundraisers we hope to see you out and about soon! The answers to your most burning questions.